Massachusetts Congressman Richard Neal met with reporters in Springfield Wednesday to discuss the midterm election results that put the 15-year incumbent in line to become chairman of the House Ways and Means Committee. With Democrats taking control of the House after the midterm elections, a congressman from western Massachusetts is poised to be handed the gavel to the most powerful committee in the chamber. Congressman Richard Neal of Springfield – a consummate Capitol Hill insider – said Wednesday that he expects to become chairman of the House Ways and Means Committee. 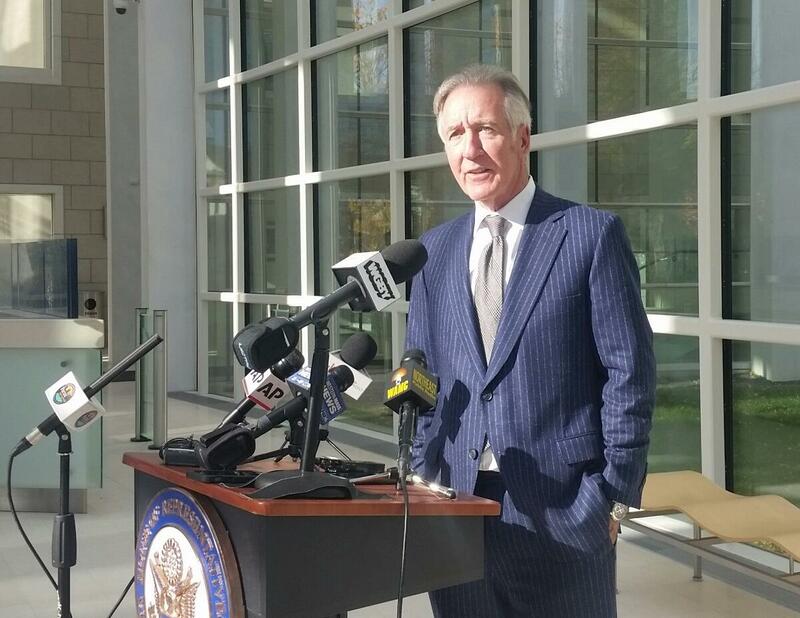 "For me this is the pinnacle of a career achievement," said Neal speaking with reporters in the lobby of the federal courthouse in Springfield, where his district office is located. He said he was grateful for the outcomes of dozens of Congressional races across the country Tuesday that gave Democrats a majority in the House. "I feel a great sense of personal satisfaction about the candidates who were recruited and prevailed last night," said Neal noting that about 25 won. Neal has spent 26 years of his 30-year career in Washington as a member of the tax-writing committee. He takes pride in having studied and mastered the complex minutiae of both the tax laws and the legislative process.
" If you want inside baseball, I'm your guy," Neal said at one point while answering a question about the process that would make him a committee chairman. As chairman of the Ways and Means Committee, Neal has the statutory authority (as does the chairman of the House Finance Committee) to ask the U.S. Treasury Dept. for the president’s income tax returns.
" Yeah, I think we will," said Neal, who added he assumed the request would trigger a court case "that would go on for a period of time." President Trump broke with decades of tradition when, as a candidate two years ago, he refused to make his tax returns public. He said at a news conference Wednesday that he would continue to resist calls to disclose the returns which he said are still being audited. Neal said he has had conversations already with Nancy Pelosi, who is likely to become Speaker of the House, about a legislative agenda. He said it should start with healthcare and preserving the Affordable Care Act’s protections for people with pre-existing conditions. "For me, strengthening Medicare, strengthening Social Security would be priorities and compromising them would fall on deaf ears," said Neal. He said he hopes for compromise with the White House and the Republican-controlled Senate on issues including infrastructure spending, prescription drug costs, and trade. "There are things you can do, even in this atmosphere, to show that you know how to govern," said Neal. Neal, who was very critical of the massive tax cut approved by Congress last year, said he expects to hold hearings on tax policy. Trump said Wednesday he wants to pursue a 10 percent tax cut for the middle class that he proposed at campaign rallies in the final days leading up to the election. Winds of change may have blown over some of the Massachusetts political landscape Tuesday, but a longtime incumbent prevailed in a Democratic primary for Congress in the western part of the state. Massachusetts voters ventured to the polls through downpours and the occasional rumble of thunder Tuesday in what local election officials described as a heavy turnout likely motivated by national politics.